The Grace Church as we know it today was originally part of All Saints Parish, Frederick, which was organized from Prince George’s Parish in 1742. 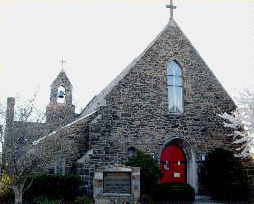 In 1801, St. Mark’s Parish was formed with St. Mark’s, Petersville as the “mother church” of the parish. By 1890, St. Mark’s Parish in Frederick and Washington Counties included the churches of St. Mark’s in Petersville (1800), Grace Chapel in Brunswick (1890), St. Luke’s in Brownsville (1837) and St. John’s Chapel in Burkittsville (1896). All of these churches were served by one rector and one assistant, who traveled by walking or by horse and buggy. In 1890, the Baltimore & Ohio Railroad established a freight re-classification yard in the Brunswick area. The Brunswick rail yard was the largest in the United States and many workers and their families moved into the town. The railroad company donated land for a new chapel at the corner of 2nd and A Streets to meet the increasing needs of the growing population. Grace Chapel was erected and on Tuesday, September 12, 1893, after the building debt was paid, was consecrated and served the parishioners until 1922, when construction of the current edifice was completed. This new, larger church was consecrated on May 21, 1928 after its building debt was retired. The current church building is a modified English Gothic style with exceptionally beautiful stained glass windows. Similar church buildings made from local fieldstone are common in Anglican congregations in both the United States and Great Britain.